Follow @mcphoo Tweet This post is about the arthrokinetic reflex. The term goes back to 1956 and suggests that something done to a joint can reflexively cause muscle activation or inhibition. Eric Cobb in Z-Health (overview) makes use of this concept to show how something as simple as head position can have a negative impact on muscle activation, and that conversely, joint mobilization (and better head position) can have an immediate benefit for freeing up muscle activation for improved strength performance. There's some interesting ideas around how these reflexes relate to threat and threat modulation, but we'll come back to those at another point. Right now, let's see the effect in action. Just to walk through the following video because the audio seems to be a bit low, here's what's happening. First: demonstration of a classic issue in the Kettlebell Swing: head is way back when going for the hip snap. Why might this be a problem? that head position, that far back on the neck, may actually be reducing available power and consequently compromising the work a person wants to do. How can we demonstrate this claim? Second: Rikki Prince kindly volunteers for a hamstring muscle test, head in neutral position. All that's happening in the muscle test is that i am meeting the force that Rikki is producing so that there's equilibrium. In this case, i'm using the same force on Rikki's leg as previously used to balance his leg pushing up, and his leg goes down - right down - to the ground. Now, one could say ha you're cheating, you're using way more force. First, in the video - does it look like i'm pushing hard? face it, i'm not a big person, and Rikki's considerably taller and larger and more muscular than i. Second, this test could be done with a machine where forces are calibrated - so if you have the apparatus by all means do so. Third, you'll have to believe me, yes, that Rikki wasn't faking it - this you can also test with yourself and a colleague if you learn the technique to match people's strength. I've done this with a room full of people and there's always one person who says "didn't work for me" - I'll take that one stat of 1 out of 25. But it usually turns out when retested by someone else, it's there. I also was asked to demo this at the May 09 RKC Denmark cert. Kenneth Jay volunteered (shown left using mark cheatham as "the wall") - for those who have met him, do you think KJ would fake this test? Fourth: Head back in neutral, re- test. In this case we see the leg is a lot stronger than just a moment before, and that's just from getting out of the head cranked position. Fifth: Going further to clean up the muscle test, and re-test. Without giving poor Rikki a break we do two Z-health neck mobility drills - just to open up those neck joints more deliberately. We retest. The bigger wobble is now out of the leg, and we're as stable as we were when we started. If i was working with Rikki further, i'd keep going to do a movement assessment to get at that little bit of rumble that was there at the start and is still present at the end. At the end, a quick demo of a few swings with the head in neutral, using the eyes to look up, rather than the head cranking back. You can't see it, but i'd encourage you to try it: this technique of keeping the head neutral combined WITH the eyes charting the movement actually provides a double shot benefit for the swing. It FEELS much smoother and stronger and more effortless. This double shot is discussed further with liberal illustrations and Eric Cobb quotations and b2d synthesis/analysis in terms of "efficient movement" in yet another application: the kettlebell front squat. If you'd like more detail on the eye position in the swing, see Cobb's article cited above, and look for "eye position kettlebell swing experiment." What we do with a joint has a reflexive effect on muscular activation/inhibition. ANY joint; All Muscles - pretty much. squishing up a joint, like cranking back the head in a swing or lift, has immediate effect on muscular activation. In the case of squishing, we get inhibition. We see that going to a more open joint position (head neutral) has an immediate effect on muscle activation. We see also that that effect can be enhanced further with self-moblization around that joint. heuristic: maintaining optimal range of motion in a joint enables best strength performance/efficiency. I hope you'll try the swing demo, or try this with your deadlift or any activity - keep the joints free and open, and we're better able to activate our muscles. This free and open joint effect/relexive relation to muscles also shows why getting better range of motion around a joint can also have a direct effect on strength. This is the benefit of connecting up what we know of our neurology with our strength practice. Cool, eh? If you're interested in more of these mobilization techniques, i'd recommend starting with the z-health r-phase and neural warm up package (described here). If you'd like to learn about z-health theory and practice and have it more directly applied to kb work, and if you're gonna be in the UK on October 18, please come to the kb essentials and z-heatlh theory and practice workshop. It's about the small suboccipital muscles. These small muscles have the highest density of muscles spindles in the whole body (and apparently off all species) and have a major sensory function for antigravity organization. An extension of these muscles tends to trigger a tonus decrease of the hipjoint extensors. I've read somewhere about a study by Hubert Godard: He used a bioelectrical device to increase or reduce the tonus of the upper neck muscles. A reduced tonus led to higher running speed and increased tonus led to a reduced running speed, although although the participants were not aware of this and perceived their speed as constant. Stretching the hamstrings caused 9% increase in hip extension range of motion as measured with the passive 'straight leg raise' (SLR) manouver. Yet stretching the small suboccipital muscles resulted in almost twice as much (13%) increase of hamstring length as measured with the same SLR test. thanks for dropping by, but let's unpack what is being discussed and what you're describing. really interesting findings. thanks for sharing. i'm just sorry this demo's been conflated with these other issues, so let's unpack them a bit. i'm not sure what you're saying is "about" suboccipital muscles"
that someone loses muscle strength when relaxing their head back into fully cranked position? also not sure if the correlation in the research was only with hip flexors, but, we're not testing hip flexors in this muscle test. we're testing their antagonists. but lets suppose that what the outcome of what you're saying is, if you contract neck muscles (tonus) you get a reduced muscular effect anywhere. it's not clear that cranking the head back - i mean you can totally relax the head in that position - is triggering any contraction/tonus firing in the neck. Indeed there may be less contraction in that position than in neutral. Also the muscles aren't being stretched when in neutral position. they're neutral. also i think the effect you're describing is an on off thing: while the neck muscles are relaxed there is this effect; while they are contracted there is this other effect, as opposed to an effect that lasts post intervention/action. Neat stuff though, and i'd be the last person to say these little muscles aren't potentially contributing to the effect demonstrated. just to put any attribution of the effect to suboccipital muscles to bed, not that it isn't interesting - you can do the test with any other joint/muscle combination you like. You can jam the joint in a thumb and have the same effect - take the neck right out of the picture. And that's all we're talking about here: that an effect on a joint has an response in a muscle. again thanks for the information. fascinating. will have to go read these papers. The strength loss in the hamstrings. I wrote hip extensors (hamstrings extend the hip) not flexors. Could you show some research showing this effect? sorry you did say extensors - missed that. as said it's immaterial what joint is jammed and what muscle is tested. That's the point of the reflex. And i'd say test it yourself with someone who knows how to do a muscle test, and how to impinge a joint. While i'm fascinated by learning new stuff about the neck, and am thinking wow, dang using something where another argument may inform the response, i'm not persuaded that the subop's are tense when the head is back but i know the joints are restricted in their ROM in that position. So, at this point, as said, please by all means read up on the formal stuff around the AR and try any joint/muscle test combination. if i have time to do another video with the thumb and the quad i will, by way of a sample pairing. Hi there MC. Good info! Helium, I miss your comments on my blog so I had to hunt you down here, hehe. Very cool research Helium (would love to read the study when you find it), and you are absolutely correct that there is tons of stuff going on in the upper neck region related to nerve function and head position and the arthrokinetic reflex is just one of them (maybe the main one, but hard to say). Hamstring flexibility can be affected by TONS of stuff, including what time of the day it is even (source http://su.pr/8rKFwJ). I saw a poster at ACSM this year that showed a decrease in hamstring flexibility and strength (I think) by doing a spinal slump (slump forward and bring your head to your knees) from the increased strain on the nerves themselves; thus the body trying to protect itself. I explain that when you crank your neck funny it is like kinking a hose and it slows down the water flow (muscle power). The killer part is that you can do enough mobility work that when you bring your neck to that position it will NOT have a bad effect on muscle strength. 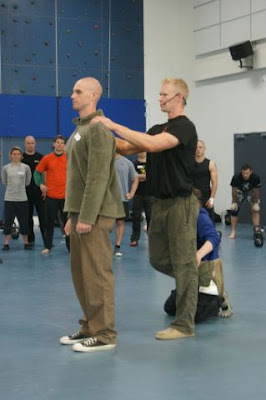 For example, at the recent Z-Health R Phase cert we did a similar demo with the feet and they were unable to jam my ankle joints since I've done enough mobility work that my nervous system can hold the joints open; even under high force. Hope that helps. I have a new bog post! Thanks for dropping by Mike. and well done resisting the Force and remaining Open. and how much joint mobility is "enough" eh eh?? Live strong && move well! Nice article, mc. and I will be trying it on my next swings. I like your comment "squishing up a joint, like cranking back the head in a swing or lift, has immediate effect on muscular activation. In the case of squishing, we get inhibition." Just as an aside, (kind of), there may well be, in this specific case, an element of direct neuro-vascular involvement as well, as the vertebral arteries (the main supply to the brain stem), will be compressed as they exit the transverse foramen. This must affect the posture/balance mechanism slightly. "as the vertebral arteries (the main supply to the brain stem), will be compressed as they exit the transverse foramen. This must affect the posture/balance mechanism slightly." thanks for sharing the idea. will be keen to check this out.